Washington, D.C. — U.S. 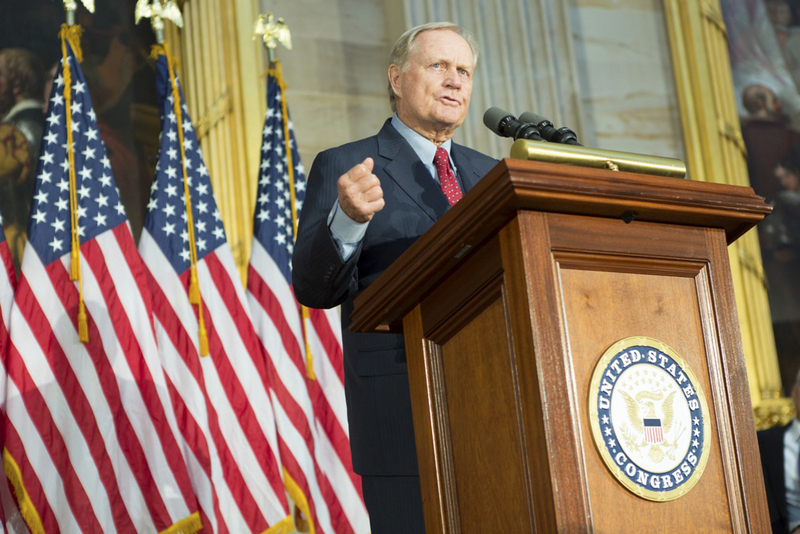 Senators Rob Portman (R-Ohio) and Sherrod Brown (D-Ohio) announced that their legislation to award the Congressional Gold Medal to the “Golden Bear,” Ohio native Jack Nicklaus, in recognition of his service to the nation in promoting excellence, good sportsmanship, and philanthropy passed the U.S. Senate. For over two centuries, Congress has awarded gold medals as an expression of public appreciation for the contributions of its most distinguished citizens. The legislation now heads to the President’s desk for signature. Since 1776, a diverse group of individuals has been honored with the Congressional Gold Medal, including George Washington, Sir Winston Churchill, Bob Hope, Robert Frost, Joe Louis, and Mother Teresa of Calcutta. Recent recipients include Neil A. Armstrong, the first human to walk on the Moon; Edwin E. “Buzz” Aldrin, Jr.; Michael Collins; John Herschel Glenn, Jr.; and Arnold Palmer. The Congressional Gold Medal and the Presidential Medal of Freedom are the highest awards bestowed on a United States civilian. Nicklaus was honored with the Presidential Medal of Freedom in 2005. He and Arnold Palmer are the only golfers in history to receive both honors. Nicklaus was born in Columbus, Ohio, and went on to win a record 18 professional major championships as part of his 73 PGA Tour victories. He became one of the world’s most acclaimed golf course designers, with almost 300 golf courses designed worldwide. Nicklaus is also known as a devoted family man and, along with wife, Barbara, a passionate philanthropist with a focus on children’s healthcare. Nicklaus founded the Memorial Tournament, which is a PGA Tour golf tournament played on his design at Muirfield Village Golf Club in Dublin, Ohio. Since its inception in 1976, the Memorial Tournament has distributed over $20 million to many Central Ohio charities, including Nationwide Children’s Hospital and its Neonatal Intensive Care Unit.